Life On Willie Mae Lane: Catching Up! Welcome back...I'm glad you stopped by. I've been super busy lately and have not had the time to post. I'm catching up by sharing some happenings from my iPhone photo roll. Nothing too exciting happening around here. I am happy to report that I am feeling so much better. I was sick for over a month, even after taking an antibiotic. I still have a cough attack occasionally but for the most part, it is gone. These photos are from the past couple weeks. The hubby and I decided to go for a 4-wheeler ride several days ago. It was fun...I hardly ever do anything like that. I went with my sister to see her middle son and his date all dressed up for prom. Aren't they a sweet couple? I've been enjoying the wildflowers growing alongside many of our highways. The phlox and Black-eyed Susan's are so pretty....such happy colors! I made a new recipe one night...skinny burrito bowls. So yummy! This past week was Teacher Appreciation week and I was gifted some sweet gifts. These are the only ones I photographed though. My principal also let us leave for lunch out one day and she paid for it. She does this every year for the entire faculty and staff. She also provided lunch at school on Friday...tacos to celebrate Cinco de Mayo! The hubby and I saw a beautiful double rainbow after we went out to supper Friday evening. I'verecedntly become an iced-coffee fan and am loving the caramel iced coffee from McDonald's. So yummy! The hubby and I sold our Volkswagen rail buggy yesterday and we both got an iced coffee to enjoy on our drive to meet the guy who bought it. I went by the consignment shop where I sell some of the things I get rid of. I only picked up one thing while I was there. I love this beautiful wreath and it was just $3! I've of course done a little shopping...I found this adorable Creamery piece at Wal Mart of all places. It was super cheap...just under $5. It is perfect in my kitchen. I haven't hung it yet...still trying to decide exactly where I want it. 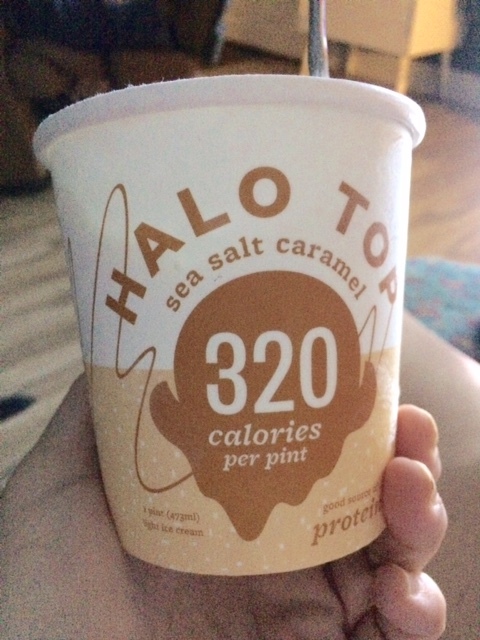 And speaking of Cream...I tried a new flavor of Halo Top and it is amazing! I love this stuff! I also found this adorable little cow card holder at the Dollar General for just $1. It is too cute! I baked a pineapple upside down cake for work lunch tomorrow. My kindergarten team and I along with several of the pre-k teachers take turns pairing up and cooking lunch on Mondays. Tomorrow is my day and this is the dessert I decided on. Rooster thinks if he sits pretty he will get a bite...lol! Over the past couple weeks, I have also been shopping with my sister for baby shower items for a shower I am helping her host next weekend. I scrapbooked all of my April photos from the Collect app on my phone. I've been cleaning and organizing at home and school. I was off this past Monday for my dad's surgery. He had another back surgery but is home now and doing well. I saw him yesterday for his birthday. Mama cooked a delicious lunch and we had a nice visit. I also started going back to my workouts last week after missing a month due to being sick. I have been so sore! I've been slowly starting to wrap things up at school. I can hardly believe this year is over...it seems like it just began! It's always a bittersweet feeling. This week promises to be another busy one, but I'm ready for it. I hope you are ready to tackle a new week as well. As always, thank you so much for visiting. I hope you have a wonderful week. Hi Vicky, I love these little posts on all that is going on with you! I too love iced coffee and I will have to try out the ones with flavor! I love making my own at home. Wow, Vicky. You have been super busy. I saw your rainbow photo on IG...what a beautiful shot. Great job getting back to you workout...I have been very bad about exercise lately and it shows! Welcome back busy lady! For some reason I've never been a huge fan of iced coffee, but love it hot! Life looks pretty good Vicky. IT is the little things that when you write them all down, you realize you have a sweet life, huh?! I always love to see what you find for cheap and then make it look amazing. I don't have that gift. I never seem to be able to see the "what it can be when I am out and about." I am working on it though. So busy but you sound happy! I'm glad you finally got well. I too have been sick for over a month and I think my cough is almost gone. Now if my energy would just return. Love your cute cow and wall plaque. We need some fun whimsy in our lives don't we! I'm dizzy just reading all that you have done! Enjoy the end of the school year. I think this must be a busy time for most of us! I love the creamery sign - I think I've seen it at our Walmart. And the cow card holder...so cute! Halo Top? What is it? It sounds delicious. The pineapple cake looks so good! Rooster is adorable; I hope he got a snack. Lol. Love iced coffee too. Now I'm craving one. What's in a skinny burrito bowl? Please share! Haha, I know I missed some stuff but I'm glad you're better and back to working out. It's just not fair how fast your body goes back to being sore and unused to working out. Enjoy your last week's of school! I can't believe you found that wreath at a thrift store and the creamery picture at Walmart! Lots of fun, happy, busy things going on with you. You have so much energy! So glad you are feeling better, especially with all that is keeping you busy! 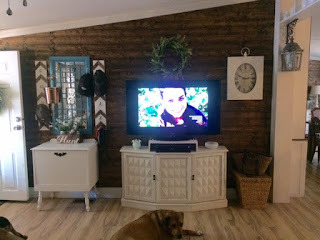 I love all your cute finds and your living room wall is just wonderful! Good luck with the baby shower! I get a lot of things from dollar stores. They have some cute decor items, and cheap prices on other stuff. Hi Vicky, I enjoyed tagging along through your busy week and I am overjoyed to hear you say that you are feeling better. A month is a long time to be under the weather. It's my turn now; I started taking an antibiotic today. Hopefully I won't be feeling icky for a month, like you did. That skinny burrito bowl looks amazing . . . we need the recipe, please:) Oh before I forget, I bought that same little sign at Walmart. I could not believe it when I saw it there . . . so cute and so cheap. Mine is hanging in my kitchen on the wall with my giant milk bottle sign. Again, so happy that you are feeling better. Wow! You have been busy, but sounds as though you are the happy kind of busy! ;) So glad you are feeling much better. Love all the new knick knacks. That cow card holder is super cute! Iced coffee is my favorite!! Its been raining for 2 days and they are calling for more for the next 2 days too! ;) Puddles are getting bigger out here! Love the flowers...they are definitely happy flowers!